Lost in an Atlantic hurricane in 1857, the SS Central America took with it ~550 passengers and several tons of gold. For more than a century it remained lost to the sea until an enterprising Ohioan named Tommy Thompson assembled a team to find and recover the ship. Utilizing cutting edge technology Thompson and his team located the wreck in 1987. 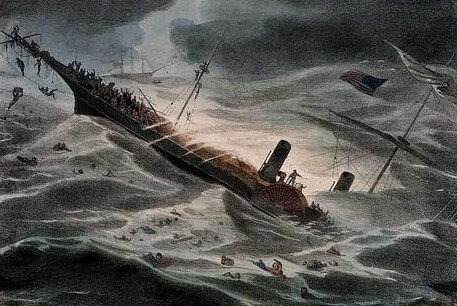 The group salvaged approximately $50 – 100 million in gold from the wreck, however, the conclusion of recovery operations was just the beginning of the story for Thompson. Two days ago, nearly 25 years since the discovery of the wreck, Thompson was to appear in a federal district court to reveal the location of millions of dollars from the recovered gold due to a payment dispute filed by former employees. Unfortunately for salvors, lengthy legal proceedings are not unusual in the realm of admiralty law – another recent example is that of Odyssey Marine’s Black Swan epic court battle which involved the US State Department, sunken Spanish treasure, artwork looted by the Nazis and WikiLeaks. Thompson’s search for the SS Central America was well documented in Gary Kinder’s Ship of Gold in the Deep Blue Sea as well as several television programs. Although an ingot from the SS Central America is expected to garner $140,000 at auction on September 2 and another ingot sold for a record breaking $8.1 million, Forbes reported in 2006 that Thompson’s last known address was a Florida trailer park.